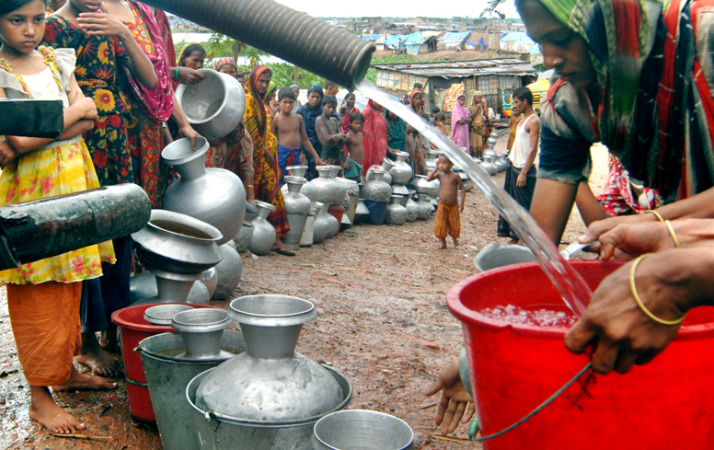 Dwellers of Mahattuli of old Dhaka did not get a single liter of water for last 14 days. They are suffering for acute water crisis in the month of Ramadan. Locals alleged, due to the crisis of water, the dwellers have to visit or stay in their relative's house in this month of holy Ramadan. They could not say when the problem will be solved. An organization named Alif-lam Meem is supplying water to the area from June 12 without any cost. They have already supplied 30 thousand liters of water till June 20. This area is under the preview of 32 no Ward of Dhaka South City Corporation. Some dwellers of Mahuttuli said, the water crisis of this area is prevailing for last two and half month. After getting complain from the dwellers of that area, Dhaka WASA authority started to repair the water supply line on June 12. To repair the water supply line, they start the repairing work in very slow pace and dig out various road of the area leading more suffering for the people. It has seen in the last afternoon, a pick up van of a non government organization is supplying water in the area. People are seen queuing with various types of pots to collect water. Billal Shah, 32 no Ward councilor said, WASA are supplying water to the area through it two water laden car. The repairing works of water line are going on in full swing. The problem will be solved within the running week. Rajar Dewry, an area of old Dhaka under the 36 no Ward of DSCC is in unbearable misery. The area name seems to be a place for king but people living in the area are suffering from electricity, gas and water crisis. The suffering of electricity or gas may be put up with but the life could not run without water. They are paying money for water but did not getting water a minimum amount. In addition, a very little amount of water they are getting from WASA is dirty and filthy. Along with Rajar Bazaar, some other adjacent areas including Shankhari Bazar, Tanti Bazaar, Radika Mohon Basak Road, Hori Prosonno Basak Road, Syed Awlad Hossen Lane, Prasanna Prosad Lane, Rakhal Chandra Basak Lane, Banshi Charan Poddar Lane, Nabo Ray Lane, Koyshal Ghosh Lane, and Ray Shaheb Lane are also suffering from severe water crisis. Almost 10 lakh people of those areas are familiar with the dirty and filthy water for long. They have to suffer for water throughout the year. According to the source, water being supplied in those areas from the river Burignaga. The water treatment plant of WASA situated in Chadni Ghat is the source of this water. But in 2009, this treatment plant declared as unfit. Furthermore, the water lines of Old Dhaka are very aged as the line being put in the 60th decades. No lines being installed after that. Regional office of Dhaka WASA informed that, if the old pipe being replaced with new one the problem would be solved. Setting up of new pipe will be start in the current fiscal with the help of Asia Development Bank (ADB). It is Uttara, a posh area of Dhaka. But people of this area are suffering from water crisis for years. The main cause for this crisis is the illegal water connection. Water are supplying from the deep tube well of WASA to the adjacent village of Uttara illegally. Water is supplying to those villages illegally through 10-12 plastic pipes. In the some places more than 20-25 pipes being used for supplying water. Security officials of Uttara Sector 12 said, some WASA officials are supplying the water through these pipes to the Fulbaria and Rekpaea villages getting a huge amount of money. General Secretary of Sector Welfare Committee AKM Nasirullah said a vested quarter is supplying water in illegal way to those villages. They are amassing a huge amount of money through this illegal means lead to a acute suffering to Uttara dwellers. He also said, we have complained to WASA mods zone of Uttara several time but no avail. In the other hand the illegal water connections are increasing day by day.